And we are done! Thirty five days, 875 kilometres - half of it in mud, 35 different chambre d'hôtes/gîtes/auberges/hotels and Casa Rurals, umpteen different villages (usually with every store, restaurant and bar closed) and always wearing the same clothes day after day after day (oft times they were clean). Just to emphasize how contrary and miserable the weather has been so much of the time on this route, this morning we started out in a good rain. Fortunately we walked out of it. It was a fairly easy walk highlighted by a great surprise stop in a little town called Enériz. We seemed to have walked into a town fiesta which always turns out well. 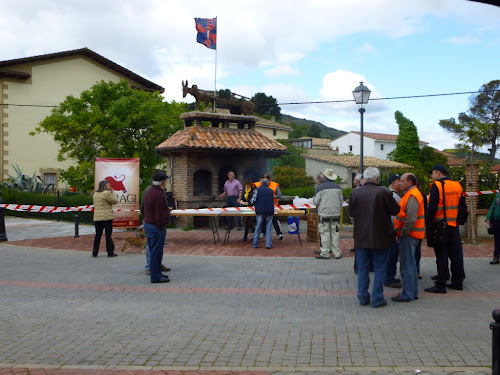 The locals were all gathered in the central square where tables were set up and bocadillas of grilled chorizo sausage or fried bacon were being handed out freely. More locals were inside the bar enjoying bottles of wine and beer and raciones of chorizo and other snacks. As Dayton had a café con leche and watched the men enjoying all these mid-morning tapas and wine, he had an epiphany. Why, when he has the guys over for drinks and appetizers, should they wait until 4:30 or 5:30pm? Why not follow the Spanish example and start mid-morning? Yes quite the epiphany! On our way into Puente la Reina, we passed the beautiful little octagonal church at Eunate which is thought to have been connected with the Knight's Templar or possibly a chapel for pilgrims. It also has a small albergue for today's pilgrims. A few kilometres later we were in Puente la Reina and we were done. There is always a feeling of disbelief at the end, more disbelief than relief...truly. 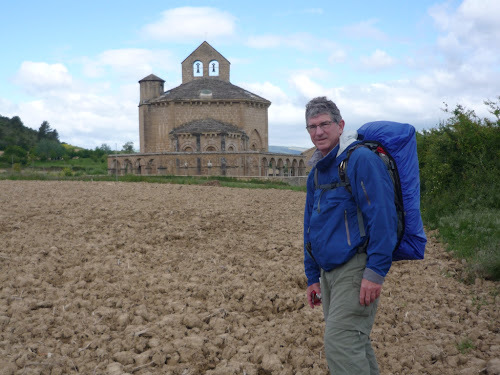 However, our end this time will be short as we are moving on to Santiago to start one more short Camino, the way to Muxia. We took a bus to Pamplona and have tickets for the oh so slow train to Santiago on Sunday, almost eight hours. After getting our train tickets we took a taxi back into the centre of Pamplona, checked into the first hotel we passed and now are about to go out and find Dayton some pintxos. 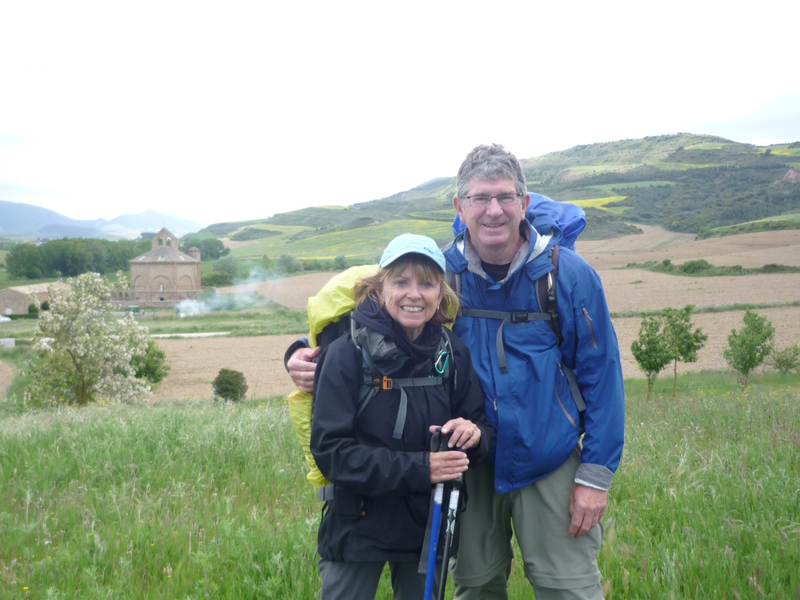 Congratulations on completing a very difficult Camino. Well done to both of you. Your blog has been great as always. Enjoy the walk out to Finisterre and Muxia. BTW, I am with Dayton on the mid morning libation timeline. All the best. Thank you for following along and encouraging. BTW at the hotel breakfast this morning there was a liquor cart right beside the Magdelena Muffins and the coffee pot. We did abstain..this time. Congratulations on completing this latest camino. So very interesting to follow with you! Relax and enjoy the walk to Muxia. I enjoyed your blog, though I thought it was very tough- I have walked the Camino Frances only, and am daunted at the idea of the long hilly walks in France. 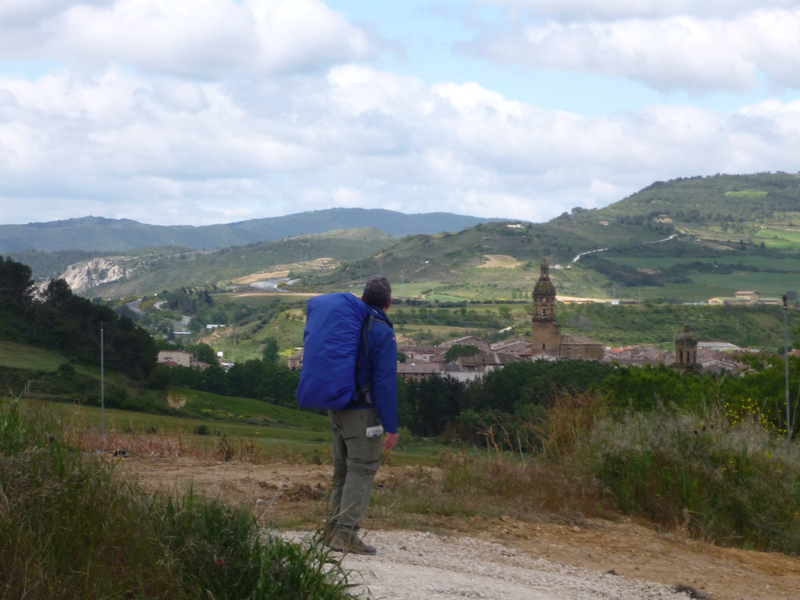 Enjoy the rest of your Camino - you certainly have earned some ease. Great going you guys. Followed your blogs with enjoyment and anticipation every day. Also with grat envy. Enjoy your next adventure. Hi guys! Exciting end! I do not know if I agree with Dayton's epiphany...I am not sure that Deer Valley can handle a mid-morning start to all the drinks & appies!! Thanks, Karen! I love your sense of humor. I have been hoping the weather will be a bit warmer and less rainy this April-May -- although I know there's no counting on anything. On the Le Puy route in 2010 I had snow, rain, and heat, all in April and May. Had turn back above Orisson in May -- total white-out and heavy snow. You've given me some ideas about what we might be able to cover in 30 days. 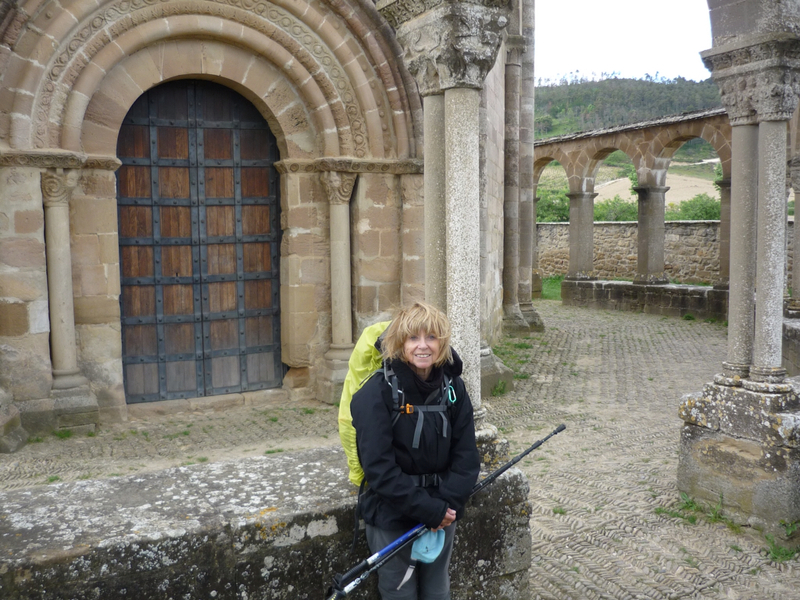 We are in oiur 70s and seem to get slower every camino, alas.